The zygomaticomaxillary complex (ZMC) is a functional and aesthetic unit of the facial skeleton. This complex serves as a bony barrier, separating the orbital constituents from the maxillary sinus and temporal fossa. The zygoma has 4 bony attachments to the skull, and ZMC fractures are sometimes known as tetrapod fractures. Trauma to the ZMC can result in multiple fractures (ie, tetrapod), but solitary bony disruption may occur, as with isolated zygomatic arch fracture. This article focuses on the zygomatic arch fracture. For information on zygomatic complex fractures, see Medscape Reference article Facial Trauma, Zygomatic Complex Fractures. In 1751, Dupuytren detailed an intraoral and external technique to reduce a medial displaced zygomatic arch. Also described was an approach to the zygomatic arch by way of a plane between the temporalis muscle and deep temporalis fascia. In 1844, Stroymeyer described the percutaneous traction technique that is still used for repair of zygomatic arch fractures. In 1927, Gillies was first to mask incisions within the temporal hairline. The zygoma is the second most commonly fractured facial bone, eclipsed in number only by nasal fractures. The vast majority of zygomatic fractures occur in men in their third decade of life. In 1994, Covington et al reviewed 259 patients with zygoma fractures and found that ZMC fractures occurred in 78.8% of patients, isolated orbital rim fractures occurred in 10.8% of patients, and isolated arch fractures occurred in 10.4% of patients. Of the isolated arch fractures, 59.3% were displaced or comminuted. Zygoma fractures usually result from high-impact trauma. Leading causes of fractures include assault, motor vehicle or motorcycle accidents, sports injuries, and falls. Arch fractures may result in trismus, flattening of the midface, asymmetry of the malar regions, or a reduction in oral aperture. Surgical exploration and fracture repair are indicated with a displaced or comminuted fracture, trismus, or significant aesthetic deformity. Although rarely indicated, emergent surgical repair and decompression are necessary when exophthalmos or signs and symptoms of an orbital apex syndrome are present. The arch, in essence, is a rim of bony armor surrounding the temporalis muscle and the coronoid process of the mandible and is the origin of the masseter muscle. The zygomatic arch is part of the facial subunit known as the zygomaticomaxillary complex (ZMC). The ZMC has 4 bony fusion sites with the skull. 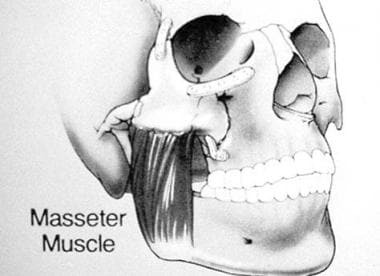 Anatomic depiction of the masseter muscle as it relates to the zygomaticomaxillary complex and mandible. Surgical correction is contraindicated in patients who are medically unstable or unable to tolerate anesthesia. Covington DS, Wainwright DJ, Teichgraeber JF, Parks DH. Changing patterns in the epidemiology and treatment of zygoma fractures: 10-year review. J Trauma. 1994 Aug. 37(2):243-8. [Medline]. Manson PN, Clark N, Robertson B, et al. Subunit principles in midface fractures: the importance of sagittal buttresses, soft-tissue reductions, and sequencing treatment of segmental fractures. Plast Reconstr Surg. 1999 Apr. 103(4):1287-306; quiz 1307. [Medline]. Terino EO. Alloplastic contouring in the malar-midface-middle third facial aesthetic unit. Terino EO, Flowers RS, eds. The Art of Alloplastic Facial Contouring. St. Louis, Mo: Mosby Year-Book; 2000. 79-96. Kelley P, Hopper R, Gruss J. Evaluation and treatment of zygomatic fractures. Plast Reconstr Surg. 2007 Dec. 120(7 Suppl 2):5S-15S. [Medline]. Turk JB, Ladrach K, Raveh J. Repair of zygomaticomalar complex fractures. The Swiss method. Arch Facial Plast Surg. 1999 Apr-Jun. 1(2):123-6. [Medline]. Vujcich N, Gebauer D. Current and evolving trends in the management of facial fractures. Aust Dent J. 2018 Mar. 63 Suppl 1:S35-S47. [Medline]. [Full Text]. Buller J, Zirk E, Kreppel M, et al. Radiomorphometric analysis of isolated zygomatic arch fractures: a comparison of classifications and reduction outcomes. J Craniomaxillofac Surg. 2018 Aug. 46 (8):1252-7. [Medline]. Hindin DI, Muetterties CE, Mehta C, Boukovalas S, Lee JC, Bradley JP. Treatment of Isolated Zygomatic Arch Fracture: Improved Outcomes with External Splinting. Plast Reconstr Surg. 2017 May. 139 (5):1162e-71e. [Medline]. Chen RF, Chen CT, Hao Chen C, Liao HT, Chen YR. Optimizing closed reduction of nasal and zygomatic arch fractures with a mobile fluoroscan. Plast Reconstr Surg. 2010 Aug. 126(2):554-63. [Medline]. Honig JF, Merten HA. Classification system and treatment of zygomatic arch fractures in the clinical setting. J Craniofac Surg. 2004 Nov. 15(6):986-9. [Medline]. Gruss JS, Van Wyck L, Phillips JH, Antonyshyn O. The importance of the zygomatic arch in complex midfacial fracture repair and correction of posttraumatic orbitozygomatic deformities. Plast Reconstr Surg. 1990 Jun. 85(6):878-90. [Medline]. Czerwinski M, Lee C. The rationale and technique of endoscopic approach to the zygomatic arch in facial trauma. Facial Plast Surg Clin North Am. 2006 Feb. 14(1):37-43. [Medline]. Gülicher D, Krimmel M, Reinert S. The role of intraoperative ultrasonography in zygomatic complex fracture repair. Int J Oral Maxillofac Surg. 2006 Mar. 35(3):224-30. [Medline]. Cohen AJ, Mercandetti M. Facial Trauma, Orbital Floor Fractures (Blowout). Medscape Reference. [Full Text]. Mercandetti M, Cohen AJ. Orbital Tumors. Medscape Reference. [Full Text]. Matsunaga RS, Simpson W, Toffel PH. Simplified protocol for management of malar fractures. Trans Am Acad Ophthalmol Otolaryngol. 1977 Sep-Oct. 84(5):ORL818-9. [Medline]. Shaw GY, Khan J. Precise repair of orbital maxillary zygomatic fractures. Arch Otolaryngol Head Neck Surg. 1994 Jun. 120(6):613-9. [Medline]. Shumrick KA, Campbell AC. Management of the orbital rim and floor in zygoma and midface fractures: criteria for selective exploration. Facial Plast Surg. 1998. 14(1):77-81. [Medline]. Pham AM, Strong EB. Endoscopic management of facial fractures. Curr Opin Otolaryngol Head Neck Surg. 2006 Aug. 14(4):234-41. [Medline]. Buller J, Zirk M, Kreppel M, Maus V, Zoller JE. Intraoperative Ultrasound Control of Zygomatic Arch Fractures: Does Additional Imaging Improve Reduction Quality?. J Oral Maxillofac Surg. 2018 Nov 27. [Medline]. Czerwinski M. C-Arm Assisted Zygoma Fracture Repair: A Critical Analysis of the First 20 Cases. J Oral Maxillofac Surg. 2014 Dec 27. [Medline]. Baliga SD, Bose A, Jain S. The evaluation of efficacy of post-operative antibiotics in the open reduction of the zygomatic and mandibular fracture: a prospective trial. J Maxillofac Oral Surg. 2014 Jun. 13(2):165-75. [Medline]. [Full Text]. Gillies approach to reduction of a zygomatic arch fracture.